I’ve got a real dislike for Sean Connery. May I explain? At repeated points in his adult life, Mr. Connery has mentioned that there are confrontational, bloody-minded women who simply “want a smack.” Well, if we’re working on the premise that people who annoy us continually should be dealt with physically, may I suggest sir that you keep an eye on the old pound of plums. For under this new system, I will feel free to kick yours back up far enough that they will only compound the difficulties people have in understanding your “Irish” accent, circa The Untouchables. In deference to your Only Hit Her With An Open Hand policy, I will boot you only with the flat top of my foot, and not a pointy-toed shoe. 3. The Sharks in the Swimming Pools. I've just wet myself trying to upload this as it is the scariest picture known to man. I know what you are thinking…shouldn’t I be blaming my sister for this? After all, it was she who, upon noticing my enjoyment of the hotel swimming pool while we were traveling one summer, said “Hey what’s that shadow down there? Do you think it’s a shark?” YOU KNOW I AM MYOPIC, KATHY! To the near-sighted, sharks are everywhere! So, yes, on the surface she looks culpable. 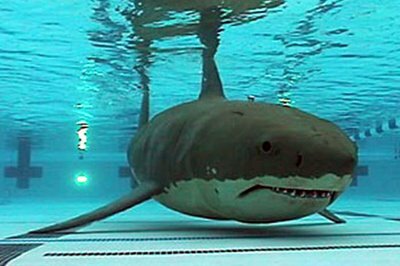 But if you dig a little deeper, I think you will find that the very premise of a shark in a swimming pool is ridiculous. If there were a sliding scale of ridiculous, rainbow-flavored magician Doug Henning would be on silly-ridiculous end of the scale, and sharks in the swimming pool would be on the James Bond-ridiculous end of the scale. And as the best loved film version of Bond, Connery is clearly left holding the bag for that crazily intense feeling that can overwhelm a person as they swim toward the ladder which will take them out of the pool and to safety…or will it? Can you swim fast enough Cookie? Can you swim faster than a shark? DID SOMETHING JUST BRUSH YOUR FOOT? DAMN YOU CONNERY! Zed the Brutal displays his tenuous front-knot. This is the one exception to my love of hairy chested men. 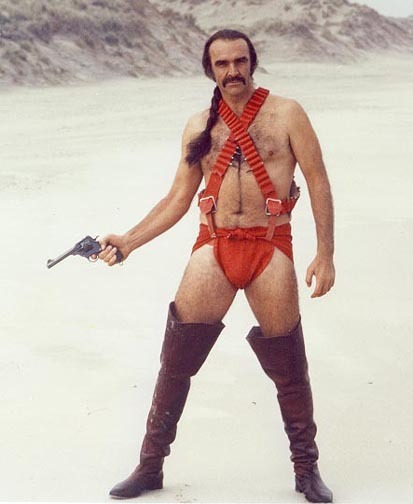 However, it’s also the shining example of exactly how an actor of this man’s caliber should have spent his career: in thigh high boots and a man-kini of bullets. Would that we lived in such a perfect world.